Real Madrid and Barcelona did their jobs this Saturday evening, as they added two more victories to their long winning streak. The Merengues had no troubles in beating Zaragoza by 4-0, while Barça defeated Celta de Vigo by 3-1, at the Camp Nou. The two teams will remain 8 points apart in the Spanish League standings, with José Mourinho's men playing in Valencia against Levante next weekend and Barcelona travelling to Mallorca. Surely not the best performance we've seen from Real Madrid this season, but it ended up being enough for the Merengues to crush Zaragoza at the Santiago Bernabéu, by a clear 4-0 result. 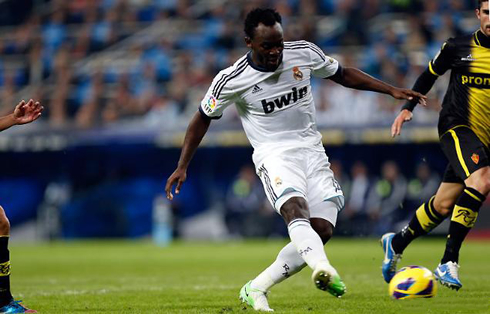 Gonzalo Higuaín and Angel di María scored still before half-time to put the home side on a comfortable lead, but the remaining two goals only took place near the final whistle and from two debutants goalscorers in Real Madrid, Michael Essien and Luca Modric. In the other hand, Cristiano Ronaldo failed to extend his goalscoring vein against Zaragoza, but neither did Messi score any goal this Saturday evening, so they will both continue on a tight race for La Liga's Pichichi in 2012/13. It took Real Madrid close to 23 minutes to score the opener against Zaragoza and it all came from a corner kick on the right, taken by Luca Modric. The Croatian midfielder curled the ball into the visitors' side penalty area, allowing Raúl Albiol to head it strong and get very close to score. However, Zaragoza's goalkeeper Roberto made a brilliant stop as he blocked the first shot, but didn't manage to clear the ball away into a safe zone. Gonzalo Higuaín was alert for that possibility and was quick to react to the rebound, as he easily pushed the ball into the back of the net, giving the home side a one goal lead still early in the game. Two minutes later, Real Madrid extended the advantage to 2-0, thanks to a good initiative from another Argentinian player, Angel di María. The always eletric winger picked up a ball passed by Cristiano Ronaldo and took on a defender just before attempting to cross the ball to Zaragoza's area. The cross got deflected on the opponent's legs but the ball remained close to Di María's feet, allowing the Argentinian to strike it to Roberto's left side. The Spanish goalkeeper blocked the shot, but saw the ball rebounding again to Angel di María and this time, the Argentinian buried it into the back of the net. Despite the two goals lead, José Mourinho's men weren't performing as they have used their fans in a recent past and the crowd disapprovement was loudly heard as half-time approached. This is the price to pay when a team sets its standards so high and the Santiago Bernabéu fans have decided not to be complacent with any sort of lack of attitude and low intensity game, during any home fixture. Real Madrid still managed to create several goalscoring chances on the 2nd half and Cristiano Ronaldo had a particular duel with Zaragoza's goalkeeper, Roberto. The Portuguese forward got very close to score in a few occasions, as it was the case of one of his free-kicks that hit the post after a slight deflection in Roberto's right hand. 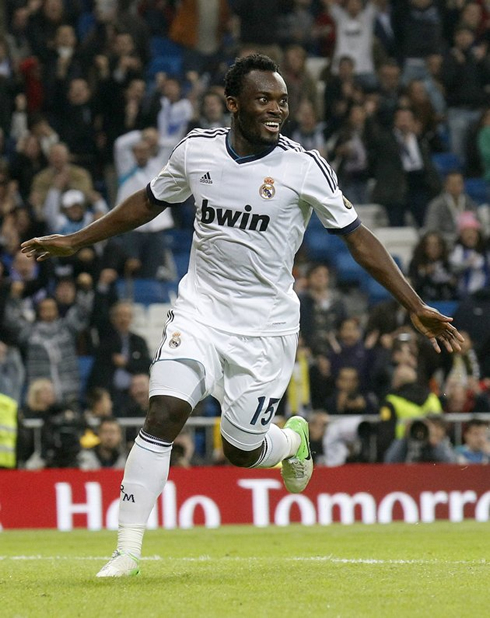 However, Ronaldo ended up not scoring and it was Michael Essien, the Ghana footballer, who didn't miss his chance to score his first goal ever for Real Madrid, putting the Merengues three goals up against Zaragoza, on the 88th minute. With added time already being played in the game, there was still time for another Real Madrid player to have his scoring debut for the club, as Luca Modric succesfully took a shot in front of Zaragoza's penalty area, sealing the deal for the night with a 4-0 final result. Real Madrid players' minds can now shift attentions for next Tuesday's big clash against Borussia Dortmund and the Santiago Bernabéu will certainly play an important role in motivating the team towards the crucial 3 points that will be at stake. As usual, you'll be able to follow Real Madrid vs Borussia Dortmund live, from Ronaldo7.net. Cristiano Ronaldo next game for Real Madrid will be against Borussia Dortmund, for the UEFA Champions League, this Tuesday night (06-10-2012). 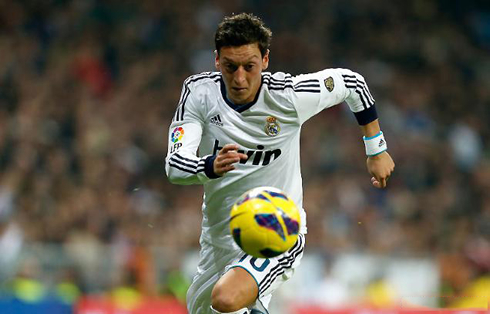 You can watch Juventus live stream, Real Madrid vs Borussia Dortmund live, Milan vs Malaga, Liverpool vs Newcastle, and QPR vs Reading, all matches provided from our soccer live section.